Hope Marketing – Is It Your Game Plan? Hope Marketing is the predominant method of marketing. The “send it and they will come” mentality has taken over most of the marketing world. Buying more and bigger ads to “beat the competition”. Not knowing which ad people are calling from. Calling customers that said no with a better price, without knowing why they said “no”. The National Association of Realtors published a study that said essentially 70% of all new listings go to the next name the seller sees when they decide to sell and only 34% of buyers found a home via an agent. Given that statistic it sounds like Hope Marketing is the way to go. The reality is that Hope Marketing is the reason there isn’t any customer loyalty, and people are so price sensitive. A good vacuum at Costco or Was-Mart is $99, and yet Shark and Dyson command huge premiums and have incredible customer loyalty. A cell phone from anyone can do basically the same thing and yet Apple and Samsung have drawn the line. A line that people who don’t have a Galaxy or iPhone X still have an opinion on. The difference is that Dyson, Shark, Apple and Samsung, don’t Hope Market. One of the most important tools in ending hope marketing is followup. A long long time ago in a city far far away, I got my first sales job selling Volkswagens at a VW/Porsche/Audi dealership. The sales manager, Jerry, taught me how to build a rolodex of business cards that included everyone I every met and gave me a simple method to follow up with them. This method has served me through two other sales jobs and four businesses. Many of my original contacts became clients at both of my sales jobs and my businesses later on. The reason is I never “hope marketed”. When a sales person from an ad agency says “You know how this works, it’s impressions, they need to see your logo often for a long time before it sinks in.”, you know you are being sold Hope Marketing. If you are the CMO of Coca-Cola, yes image impressions is important, that is called branding, not marketing. I choose fast food based on the simple fact that they sell Coke products. I am brand loyal, but I think it’s the “secret” addictive ingredient in Diet Coke. Today I use automation tools to help with my follow up marketing and now they are affordable for everyone. 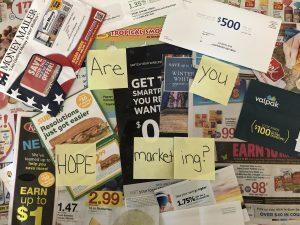 Is it time you stopped stuffing peoples mailboxes with junk mail and started following up like a pro? Scott Bourquin is a partner at the Bourquin Group LLC, a digital marketing agency. Next Topic: Is There An Easy Home Theater System?